Holiday food! One of the best parts of the season! Cranberries are traditional this time of year (Starbuck’s Cranberry Bliss Bar, anyone?) and serve as a tasty food that is appealing to look at. Did you also know they have amazing antioxidant properties that provide you with amazing health benefit? Cranberries have antioxidant power, fighting against cell damage. They have a powerful anti-inflammatory effect. They are, when eaten, a rich source of dietary fiber. When juiced, they have the ability to prevent and treat urinary tract infections. When used topically, cranberries help to rejuvenate the skin and are rich in antocianos and caroteinoids (Vitamin A). They are also rich in Vitamin C, helping with collagen production. That is a lot of power in one little berry! Eat Them. Drink Them. Smear Them On. 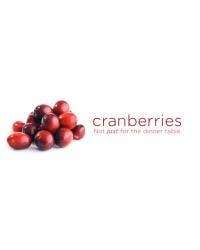 Use cranberries in your recipes to help you ingest more of the tart berry goodness! No, sugar-laden desserts are not the best options! Instead, try with protein rich Quinoa (also gluten-free!) or rice pilaf for a healthy side dish to chicken or fish! Loaded with nutrients, fiber and protein a meal like this is sure to please your nutrient hungry body! Juiced cranberries make delicious, antioxidant juices. Mix with other ingredients or drink alone. Try this festive Cranberry Antioxidant Punch as an alternative to soda or alcoholic drinks this holiday season! Just be sure to avoid adding sugar to maintain optimal health benefits! You can find plenty of yummy lotions and face care products with the antioxidant powers of cranberries included in the ingredient list. This season, why not make your own facial from the fresh cranberries you are using to cook with? The enzymes in cranberries act as exfoliants and will leave your skin healthy and silky smooth, making this the perfect pre-party facial! Mix together and smear on your face and neck. Let sit, while your rest with your feet up, for 15 minutes. Rinse. Apply your normal moisturizer. Enjoy your glowing skin! Tell us, what is your favorite way to use cranberries during the holidays?